You know who else has no budget constraint and no concept of risk aversion? 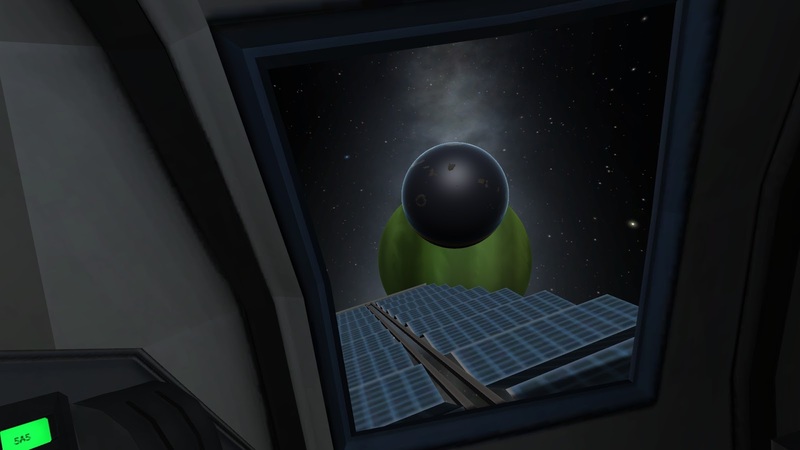 The Kerbals! I decided a fun challenge would be to see how many Kerbals I can get off-planet in two (Kerbin) years, with the ultimate goal being to land them on Laythe and set up a colony. Laythe's atmosphere, while not directly breathable by Kerbals, has enough oxygen for jet combustion. And there is plenty of water. Like, seriously a lot of water. This space plane uses four CR-7 R.A.P.I.E.R engines, hybrid engines that switch from air-breathing to closed-cycle at altitude. So, it takes off like a jet, builds up as much speed and altitude as it can, then switches to rocket propulsion to reach orbit. 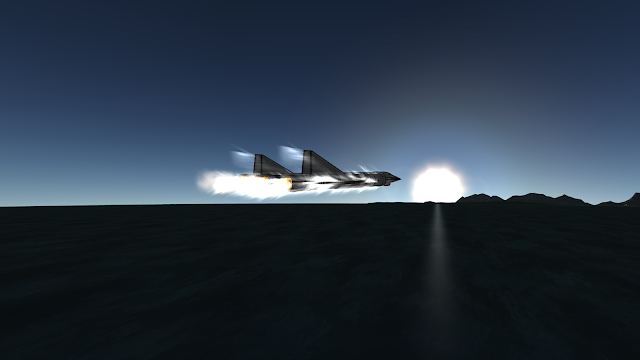 KSP's aero model was entirely redone for v1.0 and onward, making atmospheric flight both more realistic and more difficult. 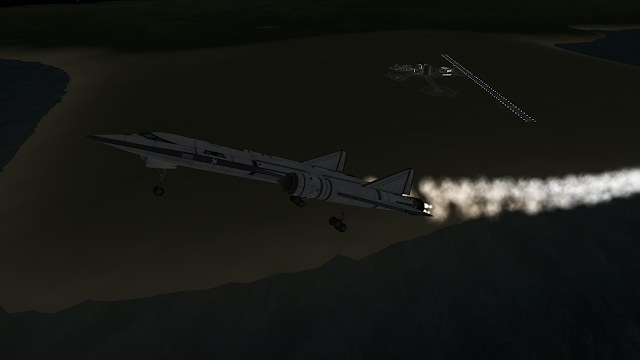 But this plane can still ferry six Kerbals into Low Kerbin Orbit (LKO) with a bit of fuel to spare. I wanted it to be modular and symmetric so it would be easier to add a propulsion stage for the long journey. This meant docking two space planes, and after some thought I decided they should be back-to-back to minimize the inertia on the long axis. (Any guesses as to why I would want to do that?) The planes are docked with two ports each for precise alignment and more rigidity. The T-shaped station is actually launched into orbit in two pieces. 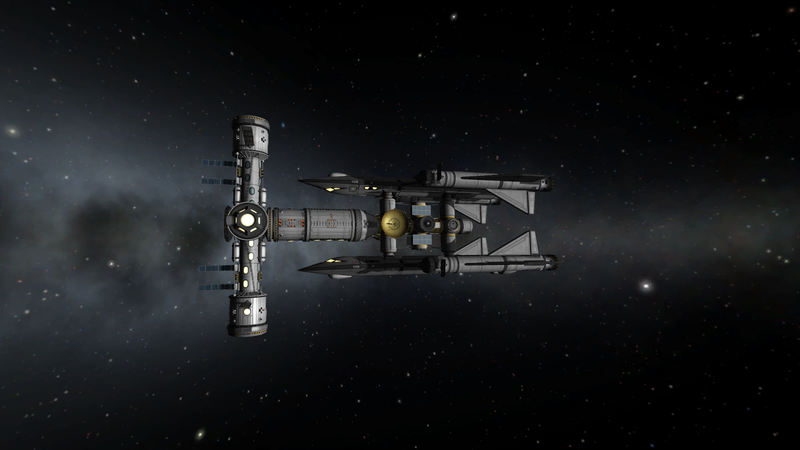 The docking module attaches to the space planes, while the crossbar of the T is the main passenger module, where the Kerbals will ride out the long trip. The passenger module will become the hub of a much larger ship once propulsion is added on opposite the docking module. Getting pieces this large into orbit is the work of a new two-stage heavy lifter. No, the first stage is not recoverable. The first stage is powered by five RE-M3 Mainsail engines, and includes all eight side-mounted fuel tanks and the bottom central fuel tank. 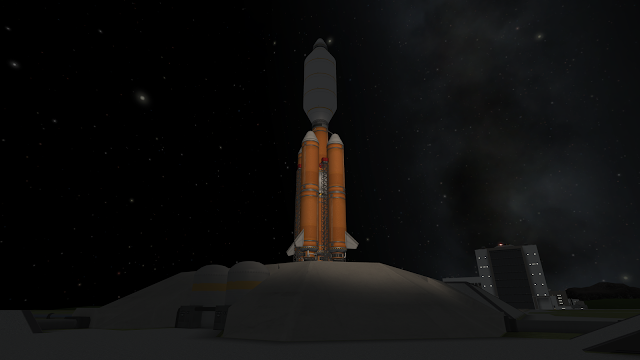 The second stage is just a single tank and Mainsail. Together, they can hurl about 50t into orbit. Except for the space planes, every piece of hardware that goes to Laythe will start out mounted to the top of one of these ascent stages. And there are many more pieces of hardware required to make the trip. The main strategy will be to send a crapload of unmanned stuff (rovers, habitats, and utility vehicles) to Laythe during the first launch window (~184d in) and then follow up with a fleet of passenger ships, based on the station above, during the second launch window (~1yr, 225d in). But, since KSP has added an element of realism in that unmanned craft need communications to be remote controlled, a network of relay satellites is also needed. All of this also needs efficient propulsion for the long leg of the trip.